The other pages re Devonian can be found here: 65, 66, 67 & 69. Here is another page of data, that will cover such data as becomes available about the Volturno passengers rescued by Devonian. Can you help with additional Devonian images or data? If so, do please write to me. The lonely little girl of about five years old, who was described in the Oct. 14, 1913 Liverpool Echo as here, is surely the 4 year old who later arrived in New York via the Carmania. (on Ellis Island manifest pages 397 & 396. (line 1) as being Henrietta Budavitch from Hungary with destination Binghamton, New York. Towards the bottom of this page, the child is identified (Oct. 18, 1913 edition of the Liverpool Echo) as being Hedgwig Dudowitz, a Slav, with parents located in Dinghampton, (means Binghamton), New York. It had seemed that she had lost all of her family. So it is gratifying to read that 20 or 30 letters & telegrams were received by the Uranium Steamship Company offering to adopt her. 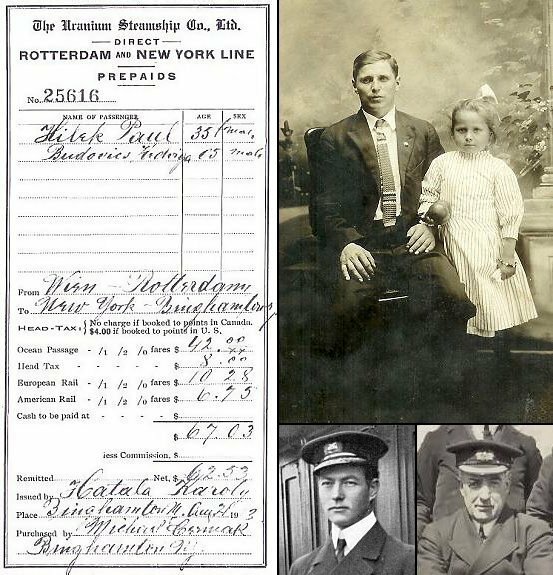 In fact she was safely delivered to her mother & step-father upon her arrival in New York, after a stay in the Ellis Island hospital, as you can read on page 21. I have wondered often about this little girl, whose experience at such a tender age must have been so traumatic. So I am pleased to now be able, amazingly, to present an image of Hedwig Budavics, for that was her name, (it became Henrietta Budavitch once in the U.S.) along with none other than Paul Hilek, the family neighbour & guardian who accompanied her as she travelled to join her mother (Elizabeth) & step-father in Binghamton, New York. The image is provided by her son, William Scimbe. William has confirmed that my 'deductions' based upon the Red Cross Report as set out on page 21, were in fact all correct - how very gratifying. The seated lady is William's great grandmother (Henrietta's grandmother) but her name is not known today. I like, whenever possible, to add a few words about what later happened to families concerned with the Volturno disaster. So I am delighted then to be able to also advise that Henrietta was born in Kopancy, a village which was then part of the Austro-Hungarian Empire. She enjoyed a long life & lived near Binghamton to the day she died at age 83 (Feb. 29, 1908 / Mar. 2, 1991). 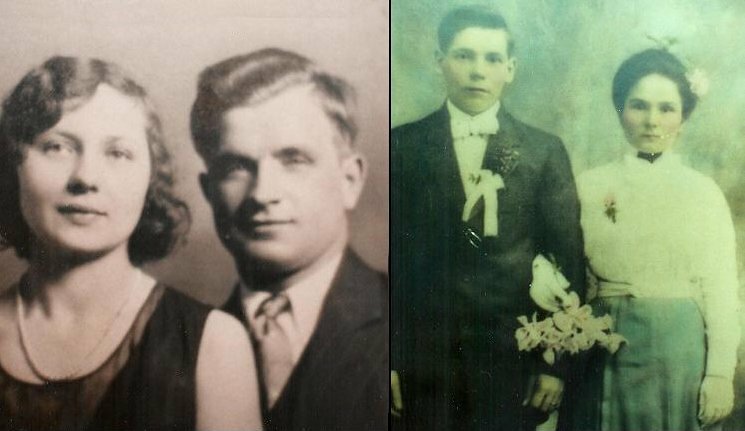 She married Angelo (Sciubba) Scimbe in Oct. 1926 & had just one child i.e. William. Henrietta's mother's name was Elizabeth Ivan Budovic, which became Elizabeth Hattala upon her marriage to Joseph Hattala. Henrietta had, I am advised, a half sister named Mary Karaim who passed away just recently (as this is written) - on Jun. 6, 2005 at the age of 91. 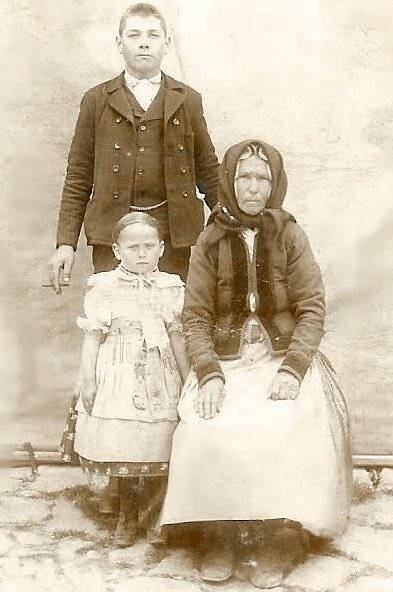 The image above must have been taken in Hungary since the grandmother (maiden name either Budovic or Ivan) stayed in Hungary & did not come to the U.S. It is interesting to note that Henrietta used to talk of her family's home in Kopancy, located in the region of Moravia in southern Czechoslovakia. And that verbal tradition includes the fact that she & Paul Hilek walked through the mountains to get to the ship that would bring them to America. On that trip, Paul had to sometimes carry her on his shoulders, when she became tired or it was cold & rainy. They may very well have walked all the way to Vienna where the land transportation arrangements booked in Binghamton, would seem to have commenced. The family home in Kopancy was a cottage with a picket fence & a large mulberry tree in the yard. She would, as a very young child, help pick the mulberries with her mother & grandmother. Bread, she used to say, was baked in an outside oven fueled by wood.�I suspect that a great many of the immigrants aboard Volturno came from somewhat similar origins. We thank William Scimbe (that's Bill at left) for all of that most interesting family data. And for the images that next follow. At left, we see Henrietta a little later in life, on the happy occasion of her wedding to Angelo Scimbe in 1926. And at right is Henrietta's mother Elizabeth with her husband Joseph Hattala, on their wedding day. Bill Scimbe has kindly provided two more wonderful items. The document that was issued by the agent in Binghamton, New York, when passage was booked in Aug. 1913 for Henrietta & Paul Hilek to travel from Vienna to the United States. And a superb studio photograph of Henrietta with 'the captain that saved her'. See below the second image for some words about that item. Re the first item, I am not sure if I should correctly call it a ticket - probably a receipt would be a better word, since actual tickets for passage on the Volturno would surely have later been issued. But the document does bear the name of 'The Uranium Steamship Co., Ltd.', & is the very first document I have seen which does that. It would seem that the Volturno passage itself for the two of them cost U.S. $42.00 with an additional head tax of U.S. $8. Henrietta would have been considered a 'half' by Uranium Line, being a child of from one to twelve years of age. So maybe the fares were U.S. $28 for Paul & U.S. $14 for Henrietta. And other rail transportation charges both from Vienna to Rotterdam & from New York to Binghamton, as you can read. Interestingly, the document records Paul Hilek, of age 35, as being a woman & Hedwiga Budovics (Henrietta), of age 5, as being a boy! Again, Bill, we thank you, for sharing your precious family data in this way! The studio image at top right was said, by Henrietta, to be of her 'with the captain that saved her', but with no identification of the name of that captain. There are, it would seem, only two captains it could possibly have been - Captain Inch of the Volturno & Captain Trant of the Devonian. In an effort to assist in the identification of that 'captain', I show in the right panel of the image, at the very bottom, the best images I have of Captain Inch (left) & Captain Trant (right). It seems to me that the studio captain is not Captain Trant since the shape of the face seems not to match. So the 'captain' in the image is almost certainly Captain Inch, but I am not 100% sure. Does anyone have data which could help with that identification? DOMBROWSKI/DEMBROSKI - Bronislav Dombrowski or Dembroski from Poland, (on Ellis Island manifest (line 7) as being Banisslaw or Branisslaw Dombrowski of Russian-Polish origin & from Minsk, Russia) then 18 years old & single, would seem to have been rescued by the Devonian & landed at Liverpool, U.K. (family records state he was landed at Liverpool & that can only be Devonian). I understand that he took passage to North America again aboard the S.S. Olympic & docked in New York. His son Harry & his three daughters, Eileen, Bernice & Julia, today live in Wisconsin. I understand that Bronislav's (Ben's) daughter Eileen believes that her father is amongst the mainly female Volturno survivors shown aboard the Devonian in the photograph above on page 65. Since the above was written, I think that the matter of the Volturno passengers rescued by the Devonian may just be a little bit clearer, as a result, perhaps of some educated guessing, as reported on page 19. But any clarifications or corrections of my data & assumptions would be most welcome. The other pages related to the Devonian are here: 65, 66, 67 & 69.